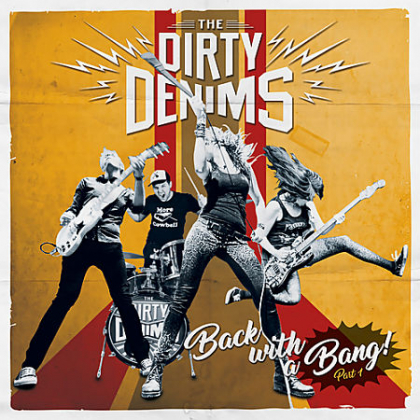 The Dirty Denims -Back With A Bang part1. For over 10 years the Eindhoven based ‘The Dirty Denims’ have been treating the world to their unique genre of “Happy Hardrock”. They play hard rock ‘n’ roll with a punk edge, they name check Joan Jett, Blondie, AC/DC, The Romantics and The Ramones as influences. Fronted by two ladies, Mirjam on Vocal/Guitar and Ashley on Bass, they are joined by Jeroen on Guitar and Thomas on the Drums to create a very likable sound, full of energy and drive. You may be surprised to know that they have supported Slash, Golden Earring, Cheap Trick, Steel Panther and The Datsuns, as well as playing the Lowlands, Rockin' Park, Zwarte Cross and Bospop Festivals. So far The Dirty Denims have released 2 EP's (Going Out / Wanna Be Famous), 1 full length album (High Five) and 2 singles (the singles are released by the Spanish label Ghosthighway Recordings). In 2017 they will release the album “Back With A Bang!” that will come out in two parts. Part 1 in April followed by Part 2 in October. “Back With A Bang” is the first and title track on this 6 track E.P. This is a great opening track, a stuttering guitar intro gives way to a more energetic riff, before Mirjam kicks the song into gear with the banshee wail of a vocal. Very simple track, but very effective in conveying what the Dirty Denims are about, good time hard rock n roll. Happy Hardrock. “Heartbeat” is a crazy two minute pop punk masterpiece, fronted by a Hammond organ, the chorus runs all over this track, and by the time you think you have figured it out, it’s finished. Time to play it again. “Money Back Guarantee” could quite easily fit on any AC/DC album, the chunky riff and drumming intro sets the tone, before once again Mirjam’s vocals lift the track, she can sing this girl, and sing well, full of raw passion and with a great range. “Don’t Waste My Time” is a fast and furious track, with some great backing vocals. The chorus comes as a pleasant surprise, with some great layered vocals before the rocking guitar drags the song off to a splintered ending. “Make Us Look Good” has a lot of AC/DC in it, from the opening riff to the solo, this track screams Angus all over it. “Can’t Get Enough of Rock&Roll” is the final track, and for me the best one. This one will have you playing air guitar, guaranteed. A great Rolling Stones style rhythm opens the track, which is followed by basically a five minute solo with a couple of chorus’s chucked in for good measure. Fantastic. This E.P is great, the band doesn’t really seem all that tight as a unit, and some of the playing is all over the place at times, but this is part of the punk way, and part of the charm of The Dirty Denims, they do not take themselves too seriously. I love Jeroen’s guitar tone on here as well, just enough punk attitude with some great rock riffs and solo’s when needed. October can’t come round soon enough.